Boat International has the first photos of the new fully custom 50 metre superyacht launched by Heesen Yachts and christened Sibelle. LOA Heesen YN 16750 was built for an experienced owner who, along with his captain, was very hands-on in the conception and build of his all-aluminium, 49.9-metre LOA yacht. The owner chose Frank Laupman of Omega Architects and Mikhail Labazov and Andrei Savin from Architectural Bureau AB Studio to style the exterior, general arrangement and interior decor of Sibelle. Omega Architects was responsible for the exterior and interior design, while AB Studio served as the interior design adviser. While attracted to the benefits of the innovative and performance-boosting Fast Displacement Hull Form, designed by naval architect Perry Van Oossanen and previously seen on many Heesen yachts including Galactica Star, the owner of Sibelle requested a Fast Displacement Hull Form yacht with a plumb bow. Heesen describes this as a radical and dramatic design feature to the already ground-breaking, but proven, Fast Displacement Hull Form design. A dedicated study was undertaken to ensure course-keeping could be maintained as well as comfortable sailing in any sea state. This included carrying out tank testing at the Wolfson Unit MTIA, putting a free running self-propelled model through the paces in extreme wave conditions, which proved the course-keeping, comfort and high-performance abilities of the hull design. 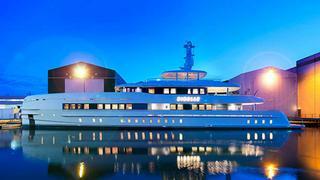 Heesen signed the contract for this new 50m explorer superyacht back in 2011. She might not appear to be your typical explorer from her exterior design, but she certainly can be considered such in her performance capabilities. Sibelle can reach a maximum speed of 18.5 knots powered by twin 1,00kW MTU 8V 4000 M63 engines, allowing transatlantic range while burning minimal fuel, leaving plenty in reserve after arriving at the destination. Her range is 3,150 nautical miles at 13 knots. Sibelle's exterior is summed up by her designers with the oxymoron: complex simplicity. The exterior lines give the illusion of running in parallel, but in reality it's all about small adjustments that give the impression of parallelism. Simplicity as the ultimate form of luxury defines the interior styling, which is cosy and inviting with bleached teak wood creating strong horizontal lines. She will accommodate 10 guests in five staterooms, with 61 square metres dedicated to the owner's suite, which enjoys a traditional placement on the main deck forward. The owner's suite boasts his-and-hers dressing rooms and en suite bathrooms. Four guest cabins, including two VIPs, one twin and one double cabin – all with en suites – are found on the lower deck. Outdoor spaces sprawl over 237 square metres, and the foredeck transforms into a party space when the rescue tenders, normally stowed here, are launched. The aft lower deck hosts a 21.5 square metre beach club and wellness area with a sauna; this space is accessed from the main saloon via a spiral staircase. Sibelle will now undergo sea trailing in the North Sea and will be delivered to her owner at the end of February 2015.